As development associates for the Walker, my colleague Kate Tucker and I hear various iterations of the above comment on a regular basis — from friends, family, potential new hires, and Walker members. It’s true, we do have fun. And we work diligently to organize fun events! In addition to fundraising for the museum, the membership and development department plans more than 75 events every year specifically for Walker members, donors, and sponsors, like Friday’s After Hours opening for the Cindy Sherman exhibition. For us, these events are a great way to meet our constituents in a social setting to learn more about their home life, hobbies, and favorite Walker programs. For Friday’s celebration Cindy Sherman we produced the Patrons’ Circle Reception and Dinner, a 90-minute cocktail reception and gallery viewing followed by a seated dinner for nearly 200 guests. There are many aspects of event planning: designing the invitation, coordinating invitation lists, tracking reservations, creating seating charts. One of my personal favorites is menu planning: my grandmother was a cooking teacher, my husband is a chef, my mom and mother-in-law are accomplished home cooks, and I am obsessed with food and love to cook. 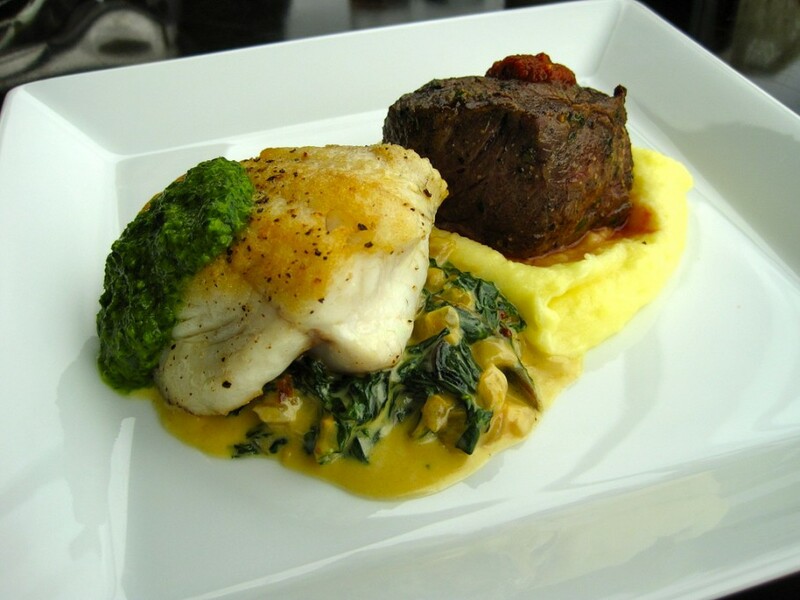 Four weeks ago, Kate and I headed over to Gather by D’Amico to taste the proposed menu. 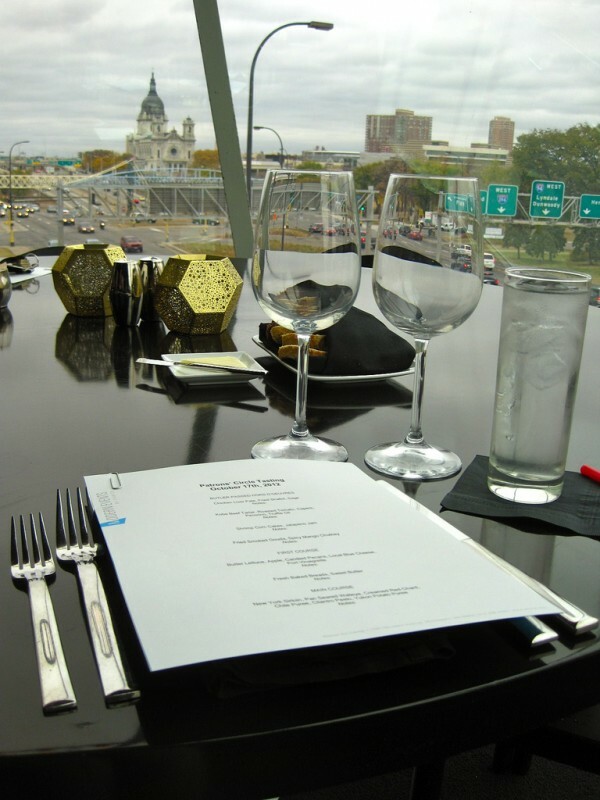 We were greeted by a great view of downtown and a printed menu for note-taking. 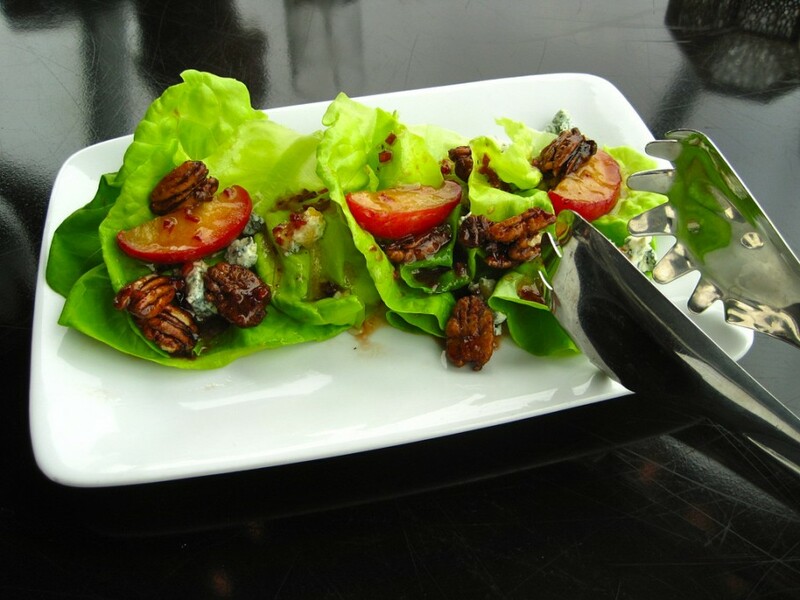 We sampled a seasonal salad with blue cheese, apples, and pecans. Chef Josh Brown explained that the apples were caramelized in butter, rum, and sugar. 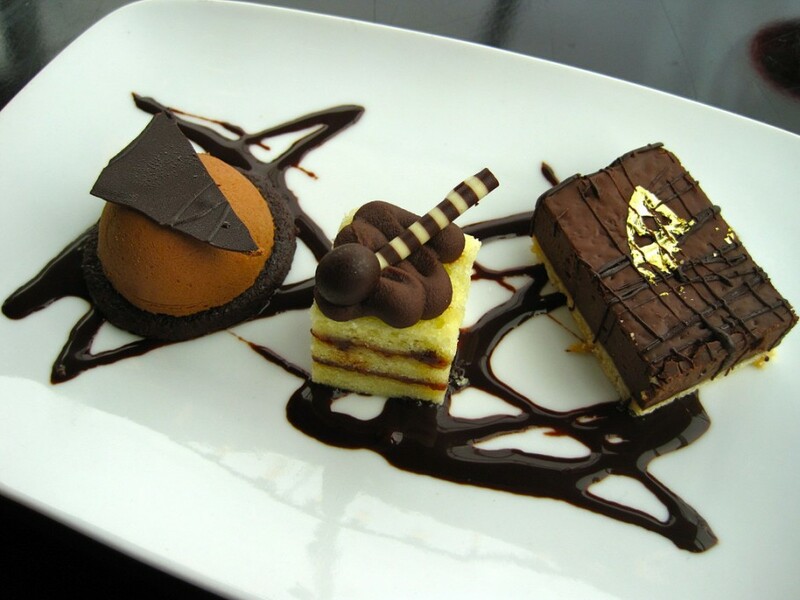 We agreed that the flavors were lovely and requested a small adjustment to the portion size. 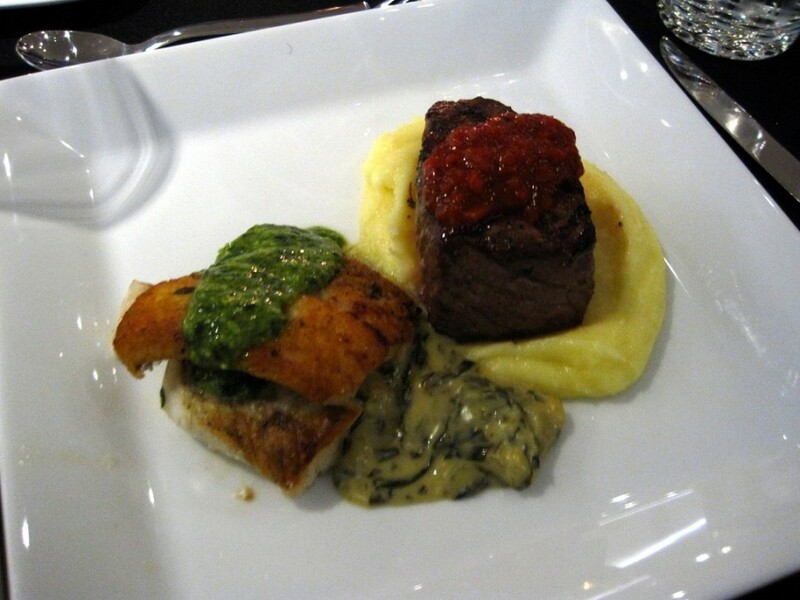 The entree was a surf and turf duo — seared walleye over creamed chard served with a cilantro pesto paired with a New York sirloin with chile puree and Yukon potatoes. Here, we wordsmithed the menu description and once again, requested a small change to the portion sizes. 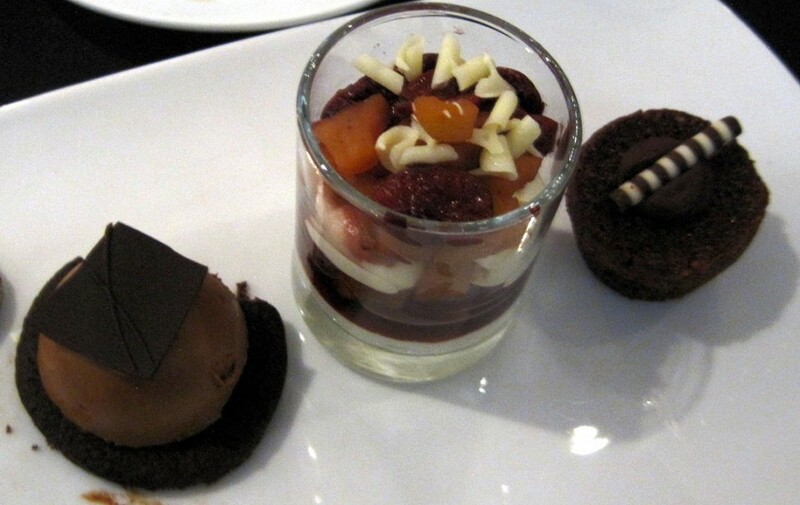 Lastly, we tried the dessert course, a trio of three chocolate desserts. Chocolate’s always a good thing, but we wanted the dessert to reflect the fall season, so one chocolate dessert was replaced with an autumn fruit napoleon with mascarpone. 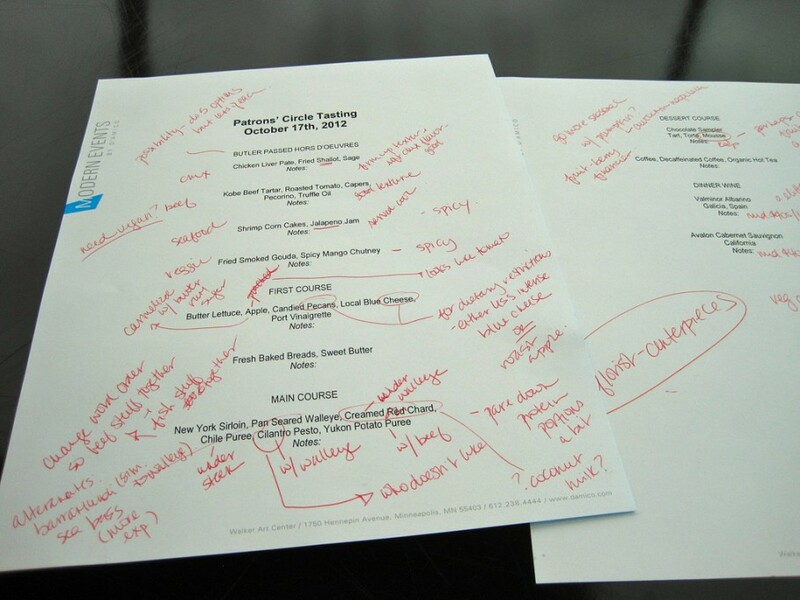 By the time we were finished with the tasting, my menu card was full of notes, questions, and reminders — all necessary considerations in planning a thoughtful event. It was a fantastic event enjoyed by art enthusiasts from all over the country. Are you interested in attending events like these? If so, contact me at patrons@walkerart.org or call 612.375.7641 to learn more!